With the commencement of the Queensland gold-rushes in the 1860s, large numbers of Chinese miners and businesses arrived, and competition with Europeans led to rising tensions. The first Chinese to come to Queensland in the 1840s and 1850s were originally welcomed. They were seen as a means of solving an acute labour shortage following the cessation of convict transportation from Great Britain, and were imported as contracted workers destined for the colony’s vast pastoral estates. Much of the anti-Chinese sentiment was rooted in the conflicts on the earlier goldfields of New South Wales and Victoria and was carried into Queensland through veterans of those fields. 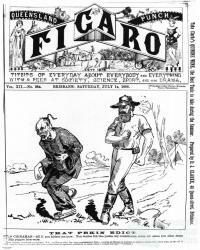 While incidents did occur on those first Queensland goldfields, antagonism towards the Chinese was brought to a head in 1875-76 in Cape York when mass immigration of Chinese to the Palmer River goldfield commenced. A combination of factors, including the proximity of the goldfield to China, meant that in a very short time the Chinese overwhelmed the European population. In European minds a sense of invasion was coupled with resentment of the apparent success of the Chinese in finding payable gold. In general, Chinese miners were better at coping with the erratic earnings and difficult conditions on the goldfield because they were supported by cooperative business networks, which provided access to essential supplies from gardens and stores, and because they systematically and meticulously worked claims and pooled their earnings. In contrast, European miners tended to work as individuals and readily abandoned claims when they were becoming less profitable. Although they were at times reviled, actual violence against the Chinese on the Palmer was relatively low. To a large extent this was probably due to the small size of the European population. 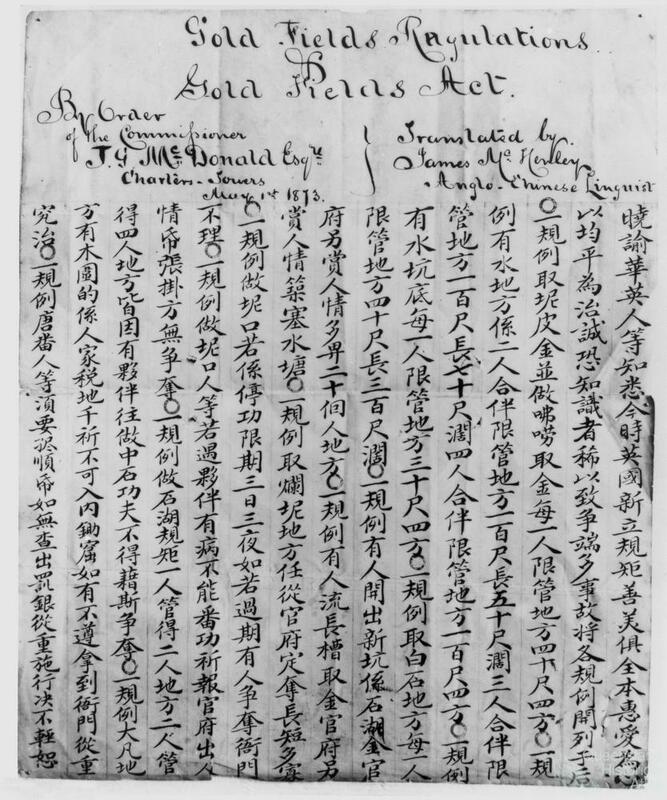 But equally important was that, by the 1870s, a system of governance had been established for Australian goldfields which recognised the rights of Chinese and other aliens. Nonetheless, the Chinese were second-class citizens forbidden to encroach on the European camps or move into new areas. A local anti-Chinese lobby group formed in 1875 and although small, it was highly vocal and had allies within the Queensland Government and media. Tensions and views originating on the Palmer focused political attention within the colony on the 'Chinese Question' and pieces of anti-Chinese legislation were introduced from this period. These focussed primarily on the areas of quarantine, health, immigration, mining and customs duties. The result of these measures was the largely successful marginalisation of the Chinese within the mining industry. 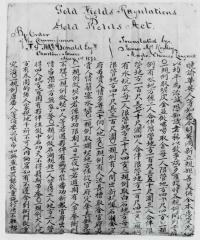 As a result of legislation, within the goldfields the Chinese were gradually barred from taking out mining leases of any description. Market garden leases became the only permissable access to land available to the Chinese. This resulted not only in the impositon of access to livelihood but also a place-based isolation as garden leases were typically located on the outskirts or completely separate from towns. In many smaller gold mining settlements where there was no 'Chinatown' business district, this meant the Chinese residents were physically isolated from the European miners. Then, from the 1880s anti-Chinese sentiment spread into other economic spheres, including manufacturing, shipping and agriculture. There was anxiety within segments of the European community, stirred up by a few political opportunists, of Queensland being overrun by the vast population of China, and having its European civilisation tainted by what were seen as an inferior people with very different values and beliefs. For the rising Union movement, the Chinese were associated with the importation of cheap, exploited labour by wealthy landholders, and therefore a barrier to democracy and working class reforms. Apart from legislation, the Chinese were attacked by a range of means, including the perpetuation of negative stereotypes, some of which painted them as degenerate and vice-ridden. There were black bans on the use of non-European labour, as occurred during the shearers’ strikes in central Queensland in the 1890s. There were also incidents of intimidation and violence. Most of these were minor acts of larrikinism or thuggery committed by a minority of the European population, often in conjunction with heavy drinking. However, some were more serious, leading to injury, death or loss of property. In Croydon in 1886, for example, 200 drunken thugs rioted against the Chinese after one of the gang tried extorting money. Two Chinese buildings were destroyed and most of the Chinese were temporarily ordered off the goldfield. Anti-Chinese sentiment was far from universal, with some places, such as Cairns and Cooktown, notable for close economic and social ties between their Chinese and European residents. It was generally in areas where the two groups were in competition that prejudice was most strident. This animosity appeared to reach a crescendo in Brisbane in 1888 when, on 5 May, approximately 1000 agitators rampaged through the Chinese quarter, smashing shop windows. Afterwards the issue subsided in the public eye. However, the colonial and later federal governments continued to introduce new restrictions. The Commonwealth’s Immigration Restriction Act 1901 drastically curtailed Chinese immigration into the country, while the Queensland Government introduced legislation which regulated the involvement of non-Europeans in the cultivation of sugarcane and bananas, both industries in which Chinese played a pioneering role, and through its Returned Soldiers Re-settlement Scheme displaced many Chinese farmers with World War I veterans.